In the Nineteenth Century, there was no Social Security system and few employers provided their workers with life insurance. Yet contagious diseases and industrial accidents took a great toll on men at the young adult ages, leaving many urban widows to support themselves and their orphaned children. Few employers were willing to put women on their payrolls, although the prominent cigar industry in Detroit was an exception and hired many women. Some widows supported themselves and their children by taking in laundry or by sewing clothes for customers. Others baked goods or developed crafts skills that might produce products that could be sold. In many large cities, in the late Nineteenth Century, Women’s Exchange and Decorative Arts Societies were formed to facilitate the sale of goods produced by widows to support themselves and their children. In Detroit, a Women’s Exchange was founded in the early 1880, but faltered and was reorganized in 1888 using the McGraw-Lightner home at 1708 East Jefferson for their headquarters. Later, the Detroit Women’s Exchange was located in a space shared with a florist at 222 Woodward in downtown Detroit. The Detroit Women’s Exchange developed a luncheon business for downtown businessmen and then a catering service. They became prosperous, so prosperous that they purchased several 1880s Victorian buildings located at 47 Adams adjoining the Central Woodward Methodist Church on Grand Circus Park. Their resources were so plush that they commissioned the Smith, Hinchman and Grylls architectural firm to put an attractive front on these old buildings, a frontage that would be compatible with the neighboring church. The present Women’s Exchange Building that you see with its several gables and embellishments resembles a medieval English inn and is, in my view, somewhat out of place on Grand Circus Park. 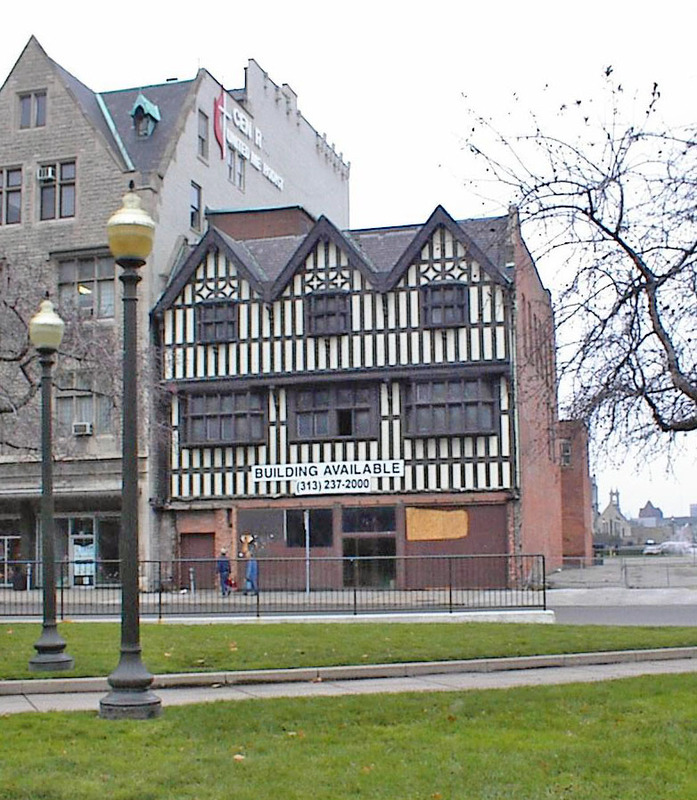 Detroit architectural critics, Eric Hill and John Gallagher, pointed out that the facelift for the old building designed by Smith, Hinchman and Grylls in 1916 was modeled after the Butcher’s Guild in Herefordshire in England, a structure that dates from 1621. In 1942, the Women’s Exchange ceased operation. The advent of the Social Security system, employer-paid life insurance, more employment opportunities for women and, most important of all, declining death rates for men at the adult ages, minimized the need for the services once provided by this organization. This building stood idle for many years. With the opening of Comerica Park and Ford Field, some developers proposed locating a restaurant and bar called the China Club in this building. Apparently, they were unable to secure the requisite financial backing. However, with the coming of the new stadia, the casinos and a rise in downtown employment it became economically feasible to convert this very old building into a sports bar. It is now home to Chelis Chili Bar with its 36 flat screen televisions, an establishment owned by former Detroit Red Wings defenseman, Chris Chelios. Architects: Architects for the original 1880s Victorian structure are unknown to me. Architects for the remodeling: Smith, Hinchman and Grylls. City of Detroit Local Historic District: Designated February 18, 1983.